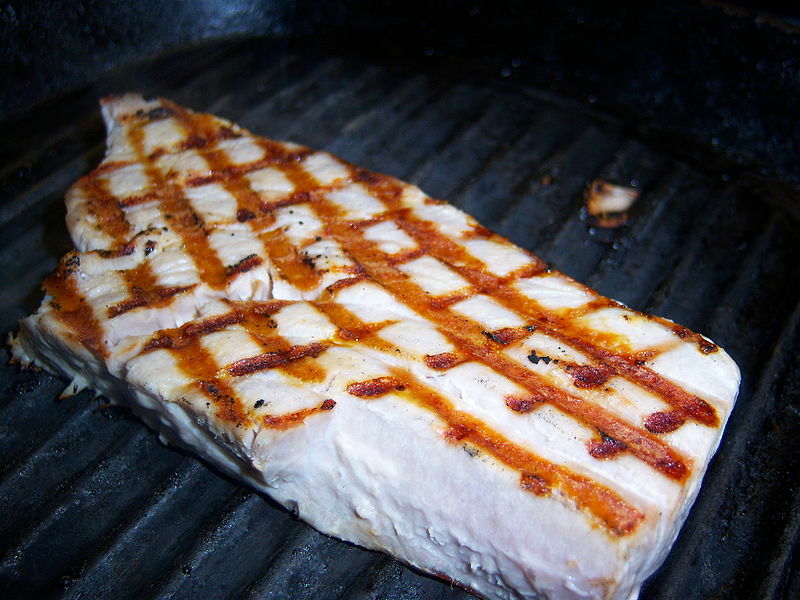 A fish steak is a portion of cut perpendicular to the backbone, as opposed to a fillet, which is cut parallel to it. For the steak to hold together during cooking, the flesh must be rather firm; fish that are often cut into steaks include salmon, swordfish, halibut, turbot, tuna, shark, sturgeon, and mahi mahi. Left: Tuna steak cooked on griddle pan. The larger fish make boneless steaks; smaller fish (such as salmon) make steaks which include skin, meat, a section of backbone, and rib bones. Smaller fish such as mackerel are sometimes cut into similar portions for curing, but these are usually not called 'steaks'. Fish steaks are usually grilled, baked, or pan-fried (with or without being breaded or battered). Sometimes fillet portions are improperly referred to as steak. Fish like salmon that is occasionally sold skin-on and has firm flesh can be grilled. These portions can look like steaks that have had been deboned (in smaller fish). Shark loin is often called steak; some people think this is perfectly fine since many beef steaks are cut from the loin—however some note that this is a deviation from the traditional cut down the backbone.